During the 19th century, Riga was a brewing capital, whose breweries worked non-stop to supply delicious beer to Rigans and neighbouring communities, eager for a taste for sweet miestiņš. The cornerstones of the Riga Beer District were the historical breweries of Kimmel, Kunzendorff and von Stritzky. Back in the day, it was said that the water sourced from the depths of the earth in this part of town was simply perfect for brewing beer. Although an age of turmoil and upheaval led to the demise of these brewing giants, the spirit of beer lives on here and is now experiencing a successful revival. First of all, Valmiermuiža Brewery established its embassy in the premises of the former Stritzky brewery. Subsequently, one new beer pub after another began to sprout up in this neighbourhood, some of which are even equipped with all the necessary brewing apparatus to brew their beers on the spot. To enjoy the very best of the beer district, we invite you to tour it in the company of a friendly guide, stopping at five watering holes, where you can savour outstanding varieties of Latvian craft beer together with delicious snacks. During the tour, you’ll have the chance to enjoy various flavours of Latvian beer and food specially chosen to complement them. You’ll also visit small brew pubs, where you’ll find out how real Latvian craft beer is brewed and embark on a truly memorable flavour adventure. Its historically symbolic location and the opportunity it offers to sample Latvian beer varieties in all their diversity make the Riga Beer District an attractive tourist destination for any self-respecting beer lover tired of the big breweries’ mass-produced beers. This is a place where beer connoisseurs, ordinary beer lovers and those in search of surprising flavours converge in the certain knowledge that here they’ll find something to satisfy every taste. The Riga Beer District is comprised of the Labietis beer workshop, the small Ziemeļu enkurs, brewery; the bars Taka ,Walters & Grapa and Kaņepes Culture Centre, which sell the products of small breweries; Vest, which is a hangout for progressive youth; the epicentre of alternative parties which is a hangout for progressive youth; the epicentre of alternative parties Autentika; Zobens un Lemess, a favourite haunt of heavy metal fans; the Valmiermuižas alus vēstniecība, and last but not least, the Alķīmiķis pub and brewery. Despite their varying natures and clienteles, these ten pubs are united by a shared love of Latvian craft beer brewed by experts, and their location, a short walk from one other. With a smile on their faces, the founders of the Riga Beer District call it a small present to the whole of Latvia and its friends on the occasion of the nation’s centenary, which offers guests the chance to enjoy beer varieties lovingly nurtured by Latvia’s master brewers and the warmest welcome in Riga. 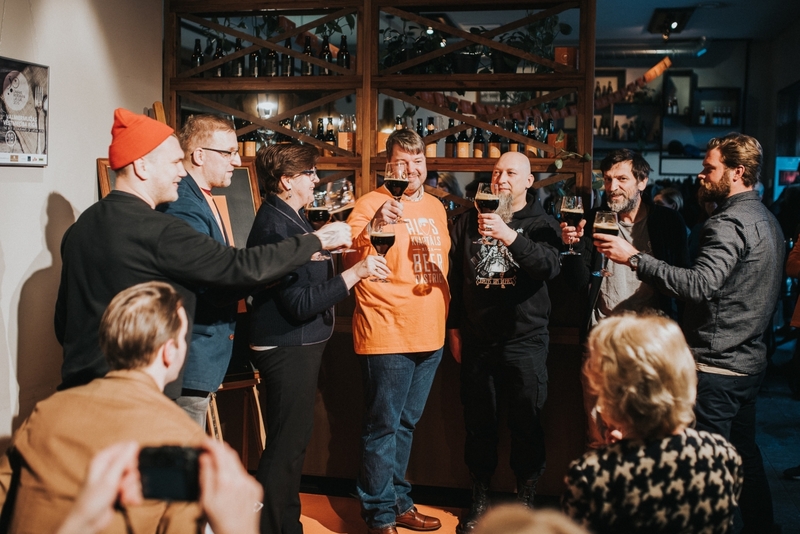 Tours of the Beer District start at the Valmiermuiža Beer Embassy, where your guide will introduce you to the extensive range of beers brewed at Valmiermuiža, which you can enjoy together with delicious snacks made from Latvia’s finest natural produce. From there, the tour will take you to three small brew pubs Labietis, Ziemeļu enkurs and Alķīmiķis, where you can not only check out how real craft beer is brewed, but also embark on a truly memorable flavour adventure. In turn, the Taka beer bar is famous for having one of the widest selections of Latvian beers, and a menu that lets you sample the diversity of Latvia’s flavours.